If you’ve driven through downtown Wichita recently, you might’ve noticed that the city’s skyline looks a little bit different. Last week, High Touch finished installing its brand new marquee signage on its corporate headquarters. This was the final piece of the company’s brand refresh that began in early 2018. 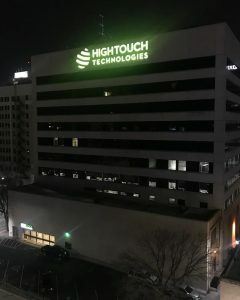 In addition to its Wichita headquarters, High Touch has updated the signage across all its outer market offices to create a cohesive brand image. When High Touch made the move downtown, it earned the naming rights to the building. In 2008, High Touch installed its logo on the Kellogg-facing side of the building. 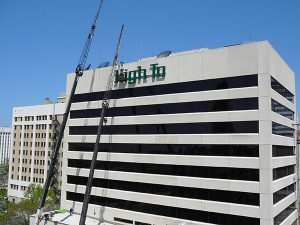 Placing signage on the building and becoming a visible part of the Wichita skyline generated additional local brand recognition for the company. The recent brand refresh helps visually communicate High Touch’s strategic growth and modernization. The company’s refreshed branding includes a new logo, fonts, color palette, and website. The updated logo, which mimics the view of a hand holding a globe, also represents High Touch’s customer-centric, worldwide vision. Do you know where the name High Touch name originated? In John Naisbitt’s best-selling book “Megatrends,” he introduces the concept of “high touch, high tech.” This concept recognizes that in a technology-driven world, people long for the human touch. With a focus on service and support coupled with technology, High Touch Technologies came to life. 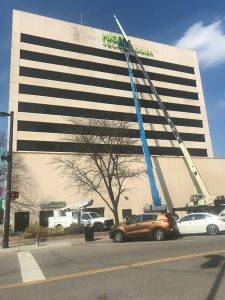 On Tuesday, March 26, 2019, Trimark Signworks Inc. closed the parking lot and began removing the old sign on the south side of the building. As cranes took down the old sign, Trimark assembled the new sign on the ground before gradually raising the pieces and attaching them to the building. Installers continued to work throughout the day before finally placing the High Touch globe in the early evening. After completing touch-up work on the 27th, electricians connected the wiring on Friday the 29th to complete the installation. Curious About the High Touch Rebrand?